It’s funny how often certain sports can be huge hits in one country, but then an absolute flop in another. For example, property tycoon Sir John Hall had a vision of turning Newcastle United into a multi-sports club, purchasing basketball side Newcastle Eagles and ice hockey outfit Durham Wasps in 1995. However, both teams failed to achieve anything close to the same popularity as their transatlantic counterparts in the United States, and the move was considered a colossal failure, with both basketball and ice hockey remaining minority sports in the UK. On the other hand, some sports that originated overseas have gone on to be monumental successes on these shores, such as the exploding popularity of mixed martial arts (MMA) in recent years. So, why do some formats flop when they move countries, while others thrive? Many people have been asking this question in the world of rugby league. Every year in Australia, two state representative teams, New South Wales and Queensland, go head-to-head in a best-of-three competition known as the State of Origin Series. Fans go mad for it, packing out huge stadiums. 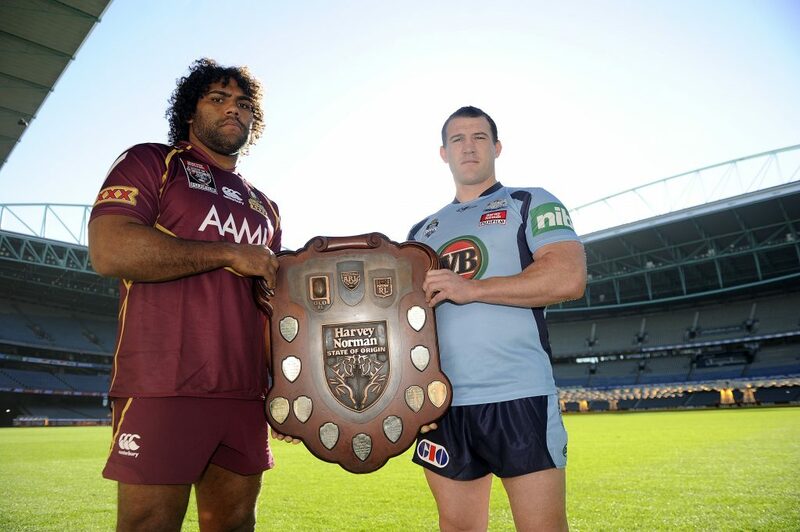 Origin player Sam Thaiday of the Queensland Maroons’ and New South Wales Blues’ captain Paul Gallen pose with the State of Origin shield. For example, the second of the three matches in 2017 saw 82,259 people crammed into the ANZ Stadium in Sydney to see the top players from each state do battle in a fantastic match, which ended in an 18-16 victory for New South Wales. Nothing other than pride is really at stake, but the fans love it. Interestingly, though, a similar format was used long, long before this in the UK, in what was known as the (now defunct) War of the Roses annual match, which saw representative teams from Yorkshire and Lancashire go head-to-head. The first of these matches took place way back in 1895, with Yorkshire earning the bragging rights after beating Lancashire in front of 9,059 of their own fans in Oldham. The game took place pretty much annually until 1991, but it never really caught the imagination of fans, with the highest-ever crowd in attendance standing at just 18,000 way back in 1900. Lancashire’s Gary Connoly holds off Yorkshire’s Keith Senior during their 2001 War of the Roses match. A low point came in 1975 when just 700 people bothered to turn up to watch in Wigan. The contest was eventually scrapped 16 years later. The match was briefly reinstated just after the turn of the millennium – named the Origin Series after the Australian format – with four matches between 2001 and 2003. Still, though, it failed to catch the public’s eye. Some people still haven’t given up on the format being a success in the UK, though. Rumours often pop up that the War of the Roses is set to return – largely due to envious glances down under at the success of the State of Origin. Similar concepts have also sprung up in football recently, with Romelu Lukaku saying he would love to see a North v South match at the end of the season – using the NBA All-Stars match as inspiration. And perhaps a Premier League All-Stars match would be a huge success. More people are watching the league than ever before, with stadiums packed out and money flying in every direction. However, the state of domestic rugby league in the UK is in nowhere near such good shape, and it would take more than a novelty annual match to change this. Energy would be better spent on getting the improving the appeal of the Super League rather than bringing back a match that was never popular in the first place.